The TechCrunch office pool predicted Vostu would respond to the Zynga lawsuit alleging that Vostu’s entire business is basically to copy every single thing Zynga does in one of two ways. They’d either use the “I know you are but what am I defense,” or just a more straightforward “It wasn’t me” approach. It turns out they just did both. 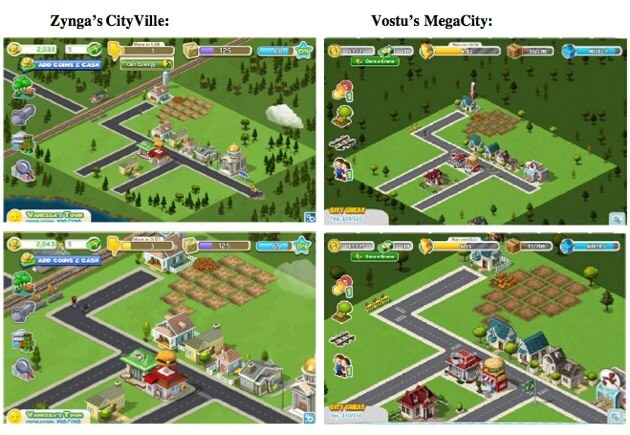 As i mentioned in our previous post, Zynga’s biggest weakness here is that they’ve “borrowed” game ideas from others, and have had to settle lawsuits because of it. But Zynga, which has done some audacious things in the past, has never had the chutzpah to not only copy a game idea, but copy every aspect of the game design and mechanics as well. Take a gander at the side by side screenshots in the lawsuit complaint attached to our original post. There just isn’t a whole lot left to say. My take: Vostu can’t win this lawsuit. I mean, they even copied the bugs in Zynga’s games.